If ever there was an animal that most exemplified a Shakespearean tragedy, it’d be the pug. The same features that have made them Instagram stars and one of the most popular dog breeds—their mushy cubed heads, bulging big eyes, and never-ending folds—also underlie the multitude of health problems from which they suffer. A new study published Monday in the BMJ suggests that the plights of pugdom are even worse than we thought. Swedish researchers surveyed 550 dog owners with pugs who turned either one, five, or eight years of age sometime between 2015 to 2016. 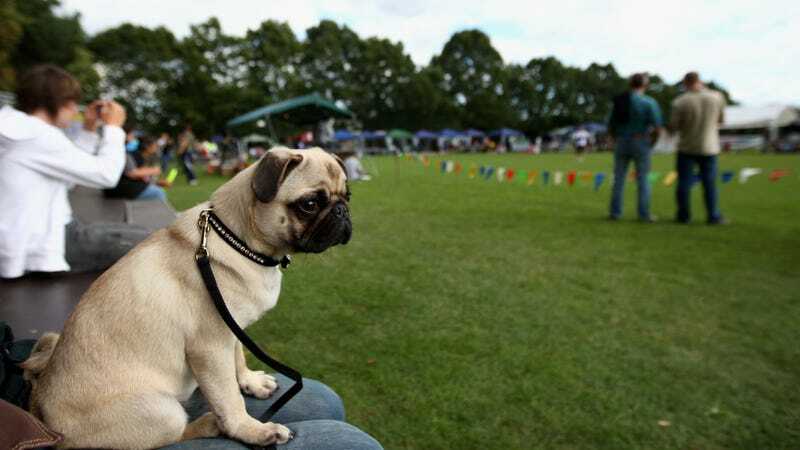 The pugs were all registered in the Swedish Kennel Club. In addition to filling out either a paper or online questionnaire, the owners were also asked to send in short video clips of their pugs walking back and forth slowly on a leash, from different angles, including the side. These videos were analyzed by two veterinary neurologists. Of those who answered a question about their pet’s gait, nearly 80 percent of the owners said their pugs had a perfectly normal walking stride. But 30 percent also said their pugs displayed direct and indirect signs of an abnormal gait, such as avoiding certain surfaces like asphalt, trouble jumping, and worn-down, bleeding nails and skin on the front side of their paws, presumably caused by dragging feet. Likewise, the neurologists judged that a third of the pugs in the analyzed videos (59 in total) had trouble walking. More worryingly, the study also found a bleak pattern among the 47 dogs who were euthanized during the study period. “Although respiratory problems have been given a lot of attention—with reason!—not only in pugs but also in other brachycephalic (short-faced) breeds—this study showed that the single most common cause for death in pugs was actually an abnormal gait,” lead author Cecilia Rohdin, a veterinary neurologist and PhD student at the Swedish University of Agricultural Sciences, told Gizmodo via email. In all, more than a quarter of deaths were tied to an abnormal gait. “This suggests that gait abnormalities are a more significant health problem than previously suggested, at least in published scientific literature,” she added. Problems walking are known to be indicative of hidden neurological or skeletal problems. But because most of the afflicted pugs had trouble with their motor coordination, the culprit seems to be much more often neurological, the authors said. The pugs were less likely to show these signs the younger they were, but they became more common after the first year. Poorly walking pugs were also more likely to have trouble going to the bathroom properly. Owners were less able to identify a poor gait than the researchers were, which might suggest they’re looking at their pugs through rose-colored glasses. But Rohdin noted that many might think these more indirect signs are harmless, since they don’t seem to cause the pugs any noticeable suffering. Because the pugs’ worn down nails and paws were likely often caused by scuffing feet, though, that could also mean they have trouble perceiving sensations, another sign of neurological issues. At this point, it’s not clear what exactly it is about the pug that seems to make them susceptible to these gait problems. Pugs are known to be at greater risk of certain brain disorders tied to a genetic cause, such as pug dog encephalitis. For their part, Rohdin and her colleagues are agnostic about whether pugs should continue to be bred. Rohdin hopes that her and others’ research can help pinpoint the hereditary causes of pug-related problems, which might lead to ways we can someday genetically select for healthier dogs.